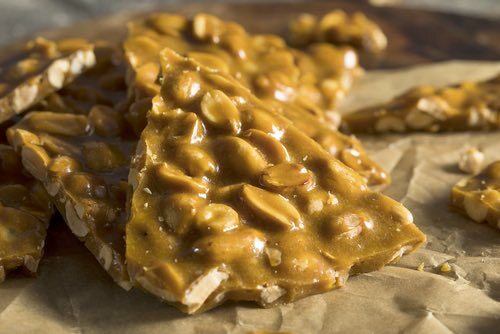 Grandma's homemade peanut brittle recipes make the most scrumptiously chewy candy imaginable. 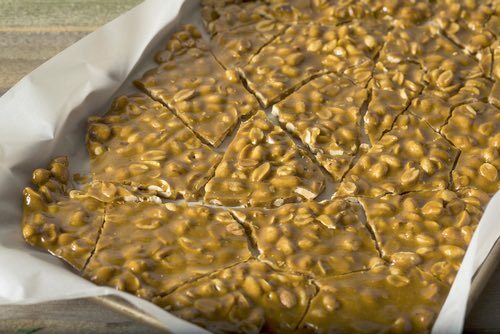 If you love the taste of peanuts and toffee, then you'll love eating the authentic homemade peanut brittle! If you've never tasted it, then you're in for a huge treat. Of all the old fashioned candies, it's one of the easiest to make and among the most delicious. These old fashioned recipes were our family's favorites for making peanut brittle candy when living on the farm back in the 1950s. Enjoy! One cup brown sugar, 3/4 cup peanuts. Put shelled peanuts, chopped if desired, in a buttered pan to set in a warm place. Melt sugar, stirring constantly and with considerable pressure. I find an old-fashioned iron frying pan is best for this. When the sugar is a golden-brown liquid stir in hot peanuts very quickly. Pour into greased pan and spread thin by tilting pan. When cold, break into desired-sized pieces. One cup granulated sugar, one-quarter cup chopped peanuts. Heat sugar until it is melted, stirring constantly. Add chopped nuts and pour quickly on greased pan. Mark into squares when slightly cooled. Three-quarters cup peanuts in shell equal one-quarter cup meats. Combine and bring to boil 2 cups sugar, 1 cup light corn syrup, 1/2 cup water, 1 teaspoon salt; cover and boil 2 minutes; uncover and cook without stirring to 300°F hard crack stage; remove from heat; stir in quickly 6 ounces or 1 cup semisweet chocolate pieces, 2 tablespoons butter, 1 teaspoon vanilla, 1 cup salted nuts, coarsely chopped; spread thinly on greased sheet. Grandma made this candy for her children when they lived on the Alberta prairie in the late 1890s. You'll love the rich, buttery taste. 1-1/2 cups molasses, 1 tablespoon sugar, 1 tablespoon vinegar. Boil until brittle when tried in water. Then add butter half size of an egg and 1 quart peanuts chopped quite fine. Spread in hot buttered pans. When cold, break up in small pieces. Same as Peanut Brittle, only add the almond nuts in time to allow them to roast a little in the boiling sugar. Brittle-type candies containing seeds and nutmeats are an ancient confection that has been made in many countries for centuries. However, peanut brittle as we know it today likely evolved in the United States as peanuts (a legume) became a popular snack during the time of the Civil War. By the late 1860s, recipes for peanut candy and boiled molasses candy with peanuts began to appear in cookbooks. The candy's name "peanut brittle," however, didn't come into common use until around 1900. If you've never tasted authentic peanut brittle candy, then you're in for a big treat. Of all the old fashioned candies, it's one of the easiest to make and among the most delicious. Years ago, our neighbor Mr. Watkins made awesome peanut brittle, and I always looked forward to sampling it at Christmas time. Though I was young at the time, I can recall loving it because he didn't skimp on the peanuts. Ever since, when people ask me how to make peanut brittle, I always suggest throwing in a few more peanuts than the recipe calls for. You'll also love the taste of the almond brittle, but when you come to think of it, why not try it with cashews or pistachios too? Choose one of these homemade peanut brittle recipes and indulge yourself.